Every mother knows the feeling. I call it “Party Planning Overload.” For me, it’s usually that moment when I’m planning my little one’s birthday celebration and, amidst all of the theme details, cake choices, and party game options, I realize that I still haven’t decided on the party favors. That was me…until about two days ago. 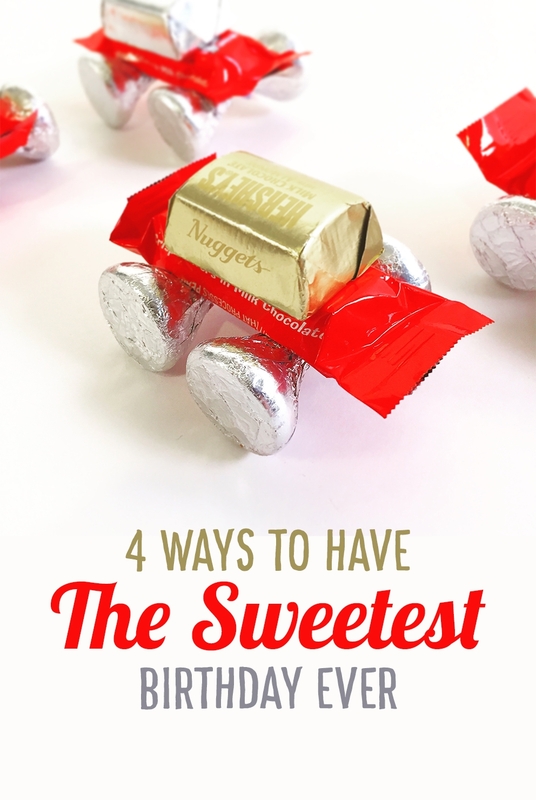 That’s when I decided that instead of the usual “little bags of trinkets and candy,” I’d turn the candy into fun keepsakes like the ones below. 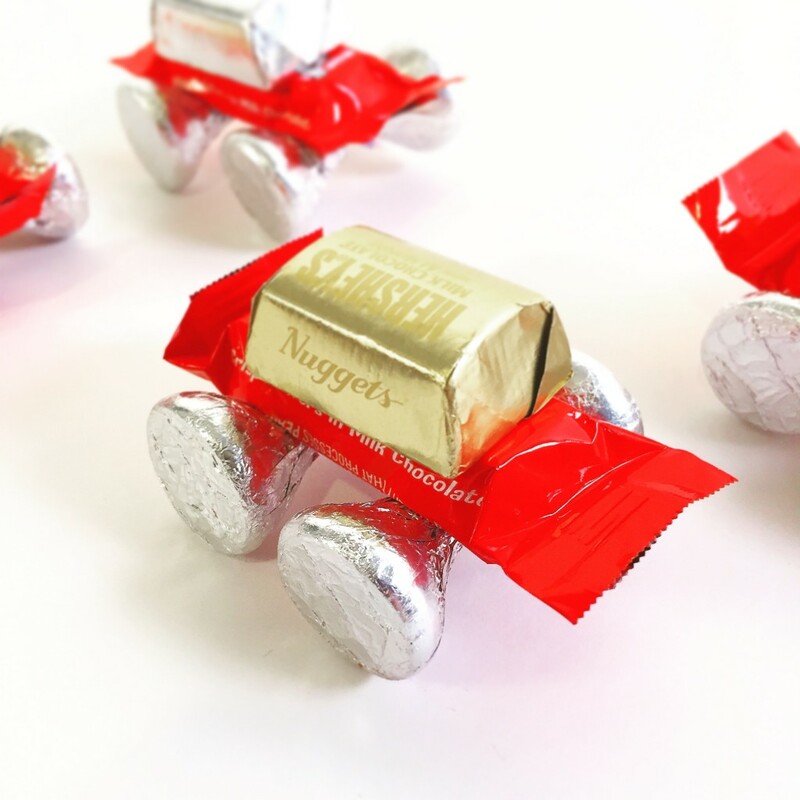 They’re super simple to make (Hershey’s makes a variety of edible options), the kids will love them, and the moms will be asking you for instructions on how to make them for their own tot’s parties! Place a Kiss at the center of the pipe cleaner. Wrap pipe cleaner around a Hershey’s Kiss. 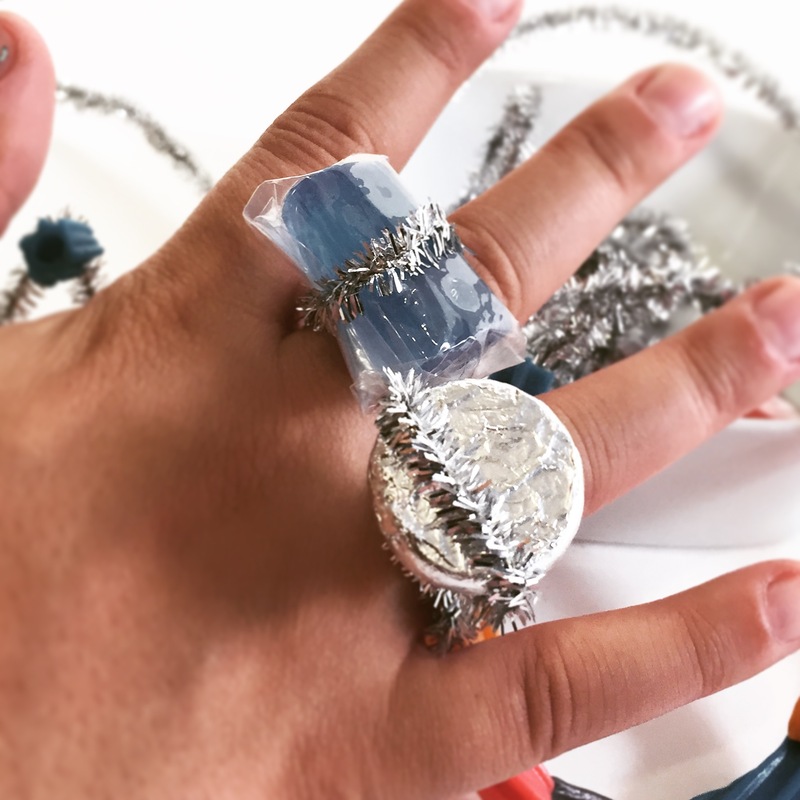 With remaining pipe cleaner, twist into ring size for child. String colored Twizzler “beads” onto pipe cleaners to desired size of necklace or bracelet. Craft tiara shape with pipe cleaners. Have child pick candy jewels (Twizzlers, Jolly Ranchers and Kisses). Glue candy onto tiara so she can be a candy queen! Melt a handful of Hershey’s Kisses. This will be your glue. Use the chocolate glue to stick all four sides of the Kit Kat bars together. After the chocolate glue is dried and the chocolate box is stable, fill the treasure chest with a bounty of Reese’s Minis and Jolly Ranchers. Place the remaining Kit Kat bar at an angle as the chest’s lid. 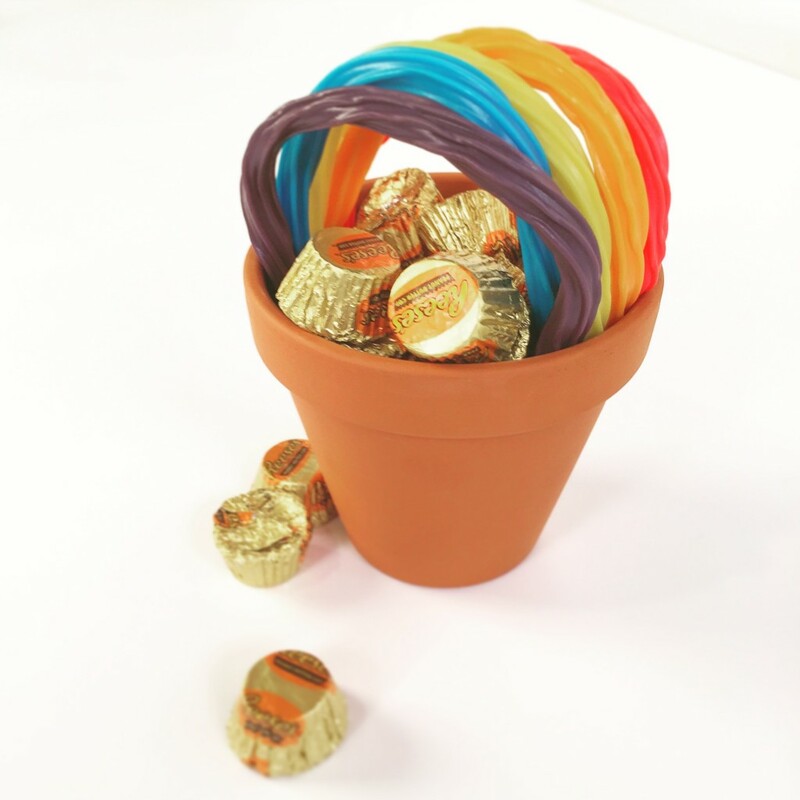 Fill terracotta pot with Reese’s candies. Arrange Twizzlers in order of rainbow colors, one of each. Place each end in terracotta pot, creating an arch handle over the Reese’s candy. Glue each of the four Kisses wheels onto the bottom of one Kit Kat bar. Glue a Hershey’s Nugget on top of the Kit Kat bar. For added fun, add a cookie teddy bear or gummy character as a driver! mmm chocolate filled with chocolate! Doesn’t get any better than that! I LOVE candy! Yum! These are the Cutest ideas! I am going to use some of them for my son’s birthday party!! I LOVE candy too, especially Hershey’s! Have you been to Hershey? The whole town smells like chocolate! How cute! 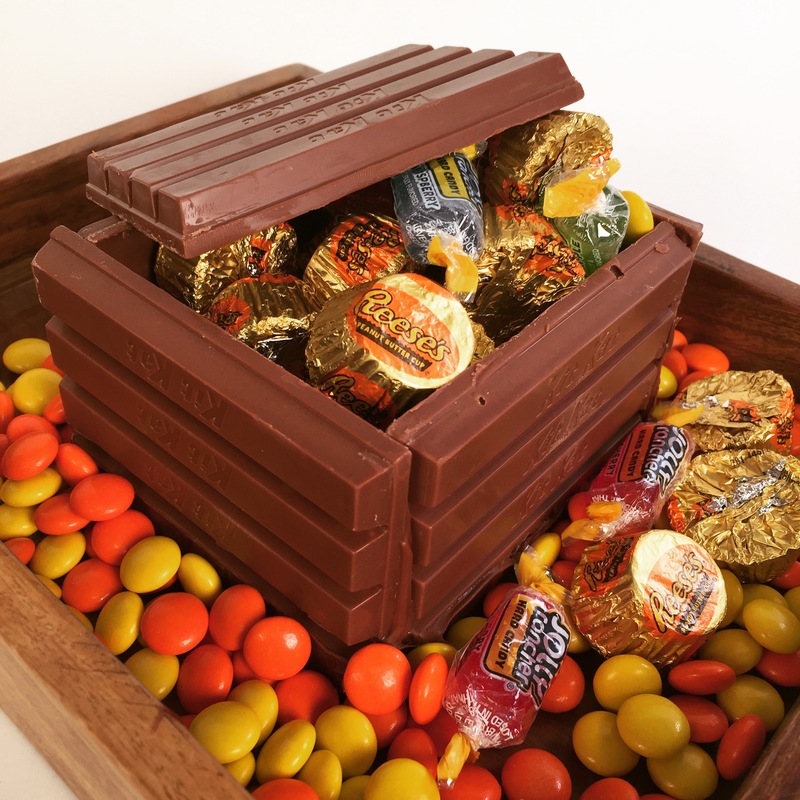 The treasure chest instantly gave me ideas for a Holloween themed treat! We for sure need to do these at our next birthday party! The kids and adults will love them! ha! I want a chocolate ring! Those are such fun ideas. My birthday is coming up and I would love a few of these. Everyone deserves some fun and chocolate on their birthday! Happy birthday early! Adorable!! I’m planning my daughter’s Candy Land party now so this is perfect! That is an adorable idea! Very unique. I can’t wait to see pics! How fun! I’m especially loving the candy treasure chest- what a creative idea! These are REALLY cool. My son’s birthday is this weekend, then it’s my daughter’s birthday and then it’s mine. It gets a little nutty here in the spring and summer! Same here. My daughter, me, my mom and brother all have summer birthdays! So busy! These are adorable. Perfect for gifts for all the guests. And easy and not expensive to assemble! Love these ideas. Especially loving the rainbow Twizzlers pot of gold! Oh boy. I love everything about this! I’m such a sweet lover, these are all great ideas! Those Kit Kat and Reeces are giving me Life! With this selection I am sure to be sweet for Life! Oh spectacular ideas. Perfect to bring a smile. Love the cars! Those would make great party favors and little boys like mine would love them! Everything is so stinking cute, but I love the candy jewelry most!! I like this idea, it’s very creative! I’m sure they won’t last long, tho! Anything made out of chocolate is a plus! These are so creative and adorable..it takes candy favors to a new level. I think the treasure box is my Fav bc I am a huge fan of Reese’s Pieces so that might be part of it!!! Very cool idea that I will def have to use!!! I love Reese’s Pieces too! They are so delicious! TOTALLY making that kit kat hut for my spouse’s birthday this June – I love that I am from PA and Hershey is here. But I never thought of a candy hut – love it! aww cute little rings! I like that they’re not TOO much sugar – just one piece of candy, and fun to make and wear. Oh my gosh this is so clever! I love the jewelry treats and the treasure chest is so cool! These are such cute ideas for little party favors at birthdays or any other party! I really like the Pot Of Gold with the rainbow licorice! These are absolutely amazing! Drooling right now for real. So creative. Your ides for playig with the candy are so fun! I like the candy rings you showed in the photo.